There are times when we feel pressured to get results. Whether it’s in our business, with a volunteer organization, or a government department, it is time to get things done, to deliver value and meet some goals. It happens to most everyone. And so, what do you do to get your team going? Here is some insight presented in the article, “8 Ideas to Revitalize Your Team’s Morale and Productivity” in the April 2018 Toastmaster magazine. Focusing on results exclusively may improve outcomes for a time, but it also burns out employees and volunteers, increasing apathy and killing morale. The key to sustaining excellent results over time is to combine a focus on achieving results with building healthy professional relationships. Rock your role. The team’s moral and performance begins with the leader. Can they look at you and see the excellence you’re asking of them? Most effective leaders show to play every day. It’s about progress, not perfection. Hone your craft. Find a mentor. Invest in a leadership development program for you and your team. Keep learning. Mind the M.I.T. Often the number one cause of poor morale, performance problems, and subpar results is a lack of clarity. You can boost morale and productivity by communicating clean, shared expectations. One way to make sure everyone is on the same page is to “Mind the M.I.T. (Most Important Thing). Be sure to prioritize. What is the most important thing your team can achieve this year? This quarter? This week? What is the most important thing they do today? Does everyone on the team know what winning looks like? Ditch the Diaper Drama. The team needs direct feedback to help them know what to continue and what to change. Most struggle to give direct feedback in a what that helps their employees. Like stinky diapers wrapped with plastic in the modern – day diaper pail, they wrap their feedback in layers of self – protection so it doesn’t offend anyone. Effective leaders speak the truth. Improve your team’s moral and productivity by having the tough conversations and speak truth with compassion. Channel Challengers. Effective leaders recognize the value every person on their team contributes. They deliberately surround themselves with people who will challenge their thinking. It’s not enough to have an open – door policy and passively wait for people to tell you what you need to hear. Instead, seek out feedback. Ask “As your leader, what is one thing I could do that would help you be more productive?” Listen, respond, and watch your team’s morale and performance soar. Own the Ugly. When you make a mistake or hurt someone, apologize and make it right and move on. Your people will be able to trust you more, and they’ll be more likely to take responsibility themselves and morale will improve. Play the Game, Don’t Game the Score. Keep the team focused on what matters most. Your customer doesn’t care what you get on your scorecard. They care about the value you deliver. Isolate the key behaviors that truly drive the value you contribute to your clients, customers, and members. Put People Before Projects. Know the unique strengths and perspectives each person brings to the team. Take the time to look at a person’s potential to perform beyond their current role. Build trust with, and between, your people. Listen to what is important to them and encourage their success. Trust the Trenches. In your team, you have a tremendous source of knowledge, insights, and performance improvements. Listen to what they have to say. Your people are your number one competitive advantage. Interesting thoughts from the article. To me, it seems like the article is basically telling you to respect people and their skills, listen to them, and work together. Whether it’s in your work, in your family, or in your church, these are things we should all work on to do better. 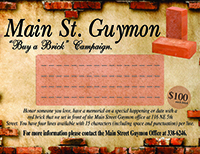 So, if the community is my team … what would you like to see happening at Main Street Guymon? Email me your thoughts to Director@MainStreetGuymon.com.